易笑园, 陈宏, 孙晓磊, 等, 2018. “7·20”气旋大暴雨中多尺度配置与MγCS发展的关系[J]. 气象, 44(7): 869-881. DOI: 10.7519/j.issn.1000-0526.2018.07.002. YI Xiaoyuan, CHEN Hong, SUN Xiaolei, et al, 2018. 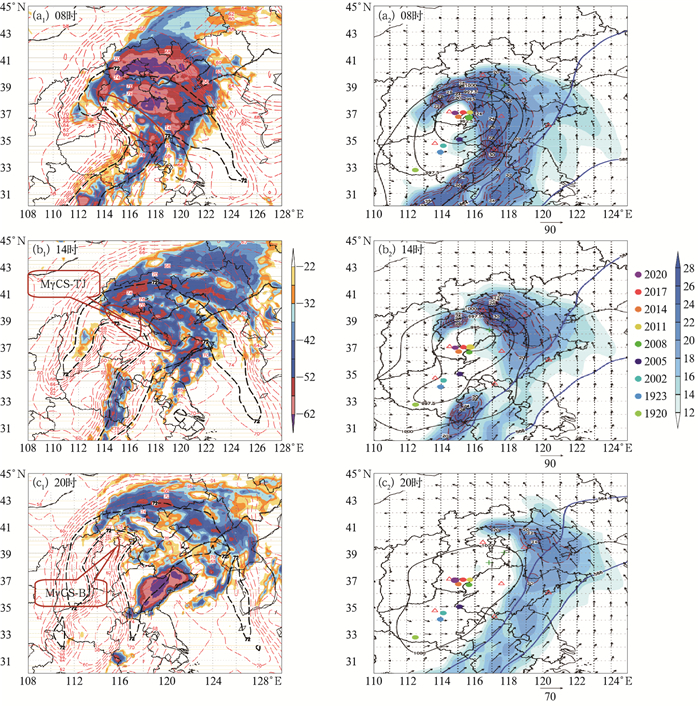 Multi-Scale Configuration of the 20 July 2016 Cyclone-Induced Severe Torrential Rain and Its Relationship with the Development of MγCS[J]. Meteorological Monthly, 44(7): 869-881. DOI: 10.7519/j.issn.1000-0526.2018.07.002. 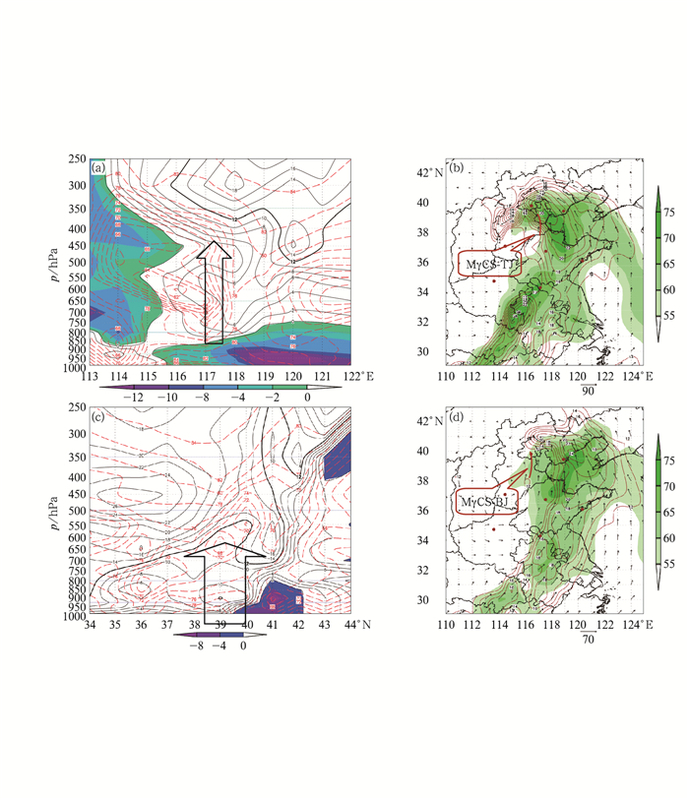 Abstract: Affected by northward cyclone, a rarely-seen severe rainstorm hit the Beijing-Tianjin-Hebei Region on 20 July 2016, resulting in a new extremum of daily mean precipitation amount in this region in the past 50 years. 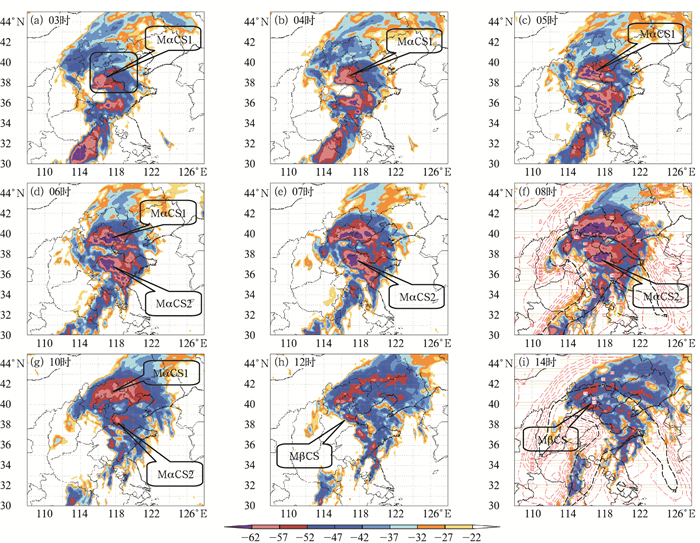 Using the FY-2F satellite data with 6 min interval and 5 km horizontal resolution, radar data and AWS (automatic weather station) data collected every 10 min, NCEP 1°×1° reanalysis data with 6 h interval as well as the methods of multiple data overlay analysis, TBB gradient computation, retrieval of radar low-level wind etc., this paper analyzes the cloud image characteristics of cyclonic rainstorm cloud system in northern China and the organization, dynamic and thermodynamic structures of multi-scale systems (synoptic scale and meso-α, meso-β, meso-γ scale convective systems). 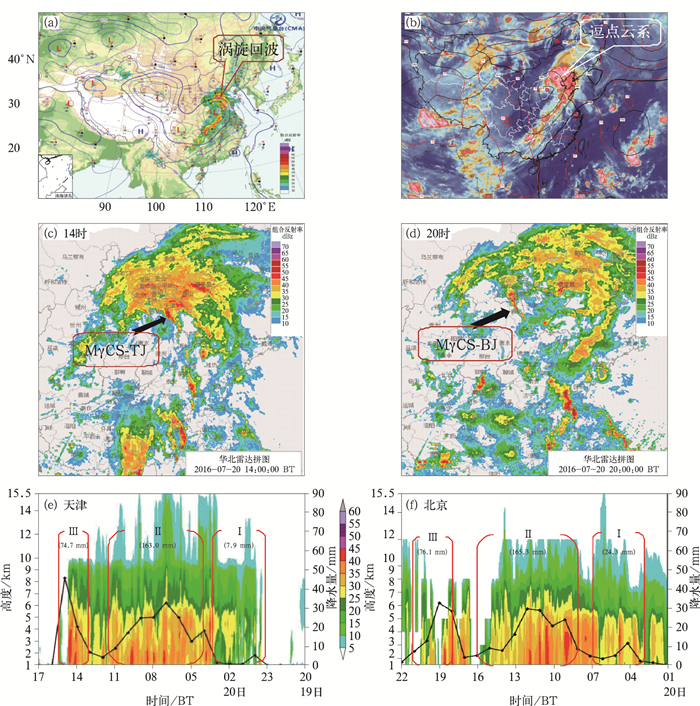 Two meso-γ scale convective systems (MγCSs), which contribute to the severe rainstorms in the urban areas of Beijing and Tianjin are taken as examples to analyze the relationship between multi-scale ambient configuration and the severe torrential rain events. The results are as follows. 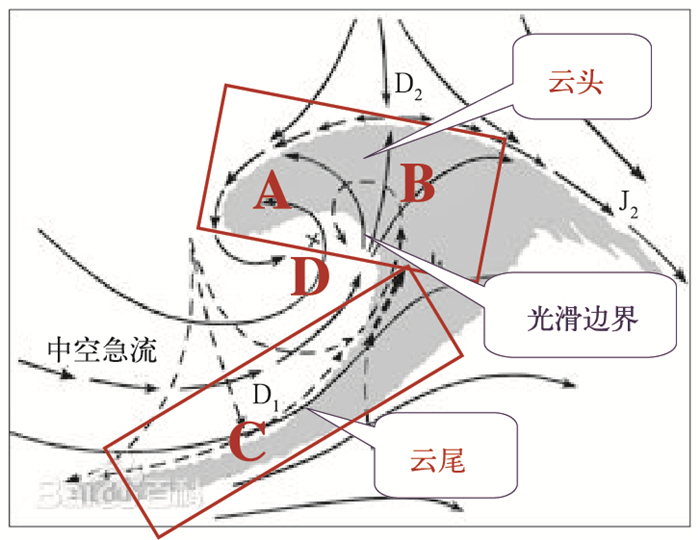 (1) The thermodynamic and vapor configurations of different parts of the comma cloud system are: the vortex center (Zone D) coincides with the center of the cyclonic circulation and is a low-value zone of the 700 hPa pseudo-equivalent temperature (θse). The west side of the tail cloud zone is a dry, cold and cloudless zone. The smooth zone at the edge of the cloud zone corresponds to the energy front zone. The head of the cloud system (Zones A and B) corresponds to the θse high-energy zone of the 700 hPa and the jet stream core of the 850 hPa, while the Zones A and B correspond to northeast and southeast jets, respectively. In the jet zone, the θse of 700 hPa is as high as 78℃, the 850 hPa specific humidity is 18 g·kg-1, the maximum jet core wind speed is 30 m·s-1, and the entire precipitable water amount is 70 mm. (2) The comma cloud system has two MαCSs and one MβCS embeded in the head, which are the major contributors to the severe torrential rains, but the rain intensity is only 20-30 mm·h-1. 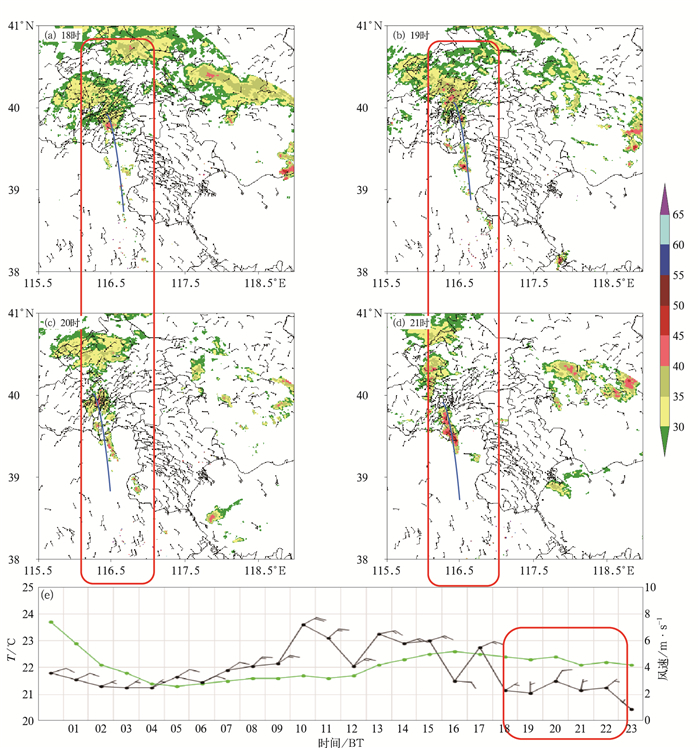 However the MγCS in Beijing (MγCS-BJ) and MγCS in Tianjin (MγCS-TJ) both caused extremely heavy precipitation with the intensity getting to 40-70 mm·h-1. 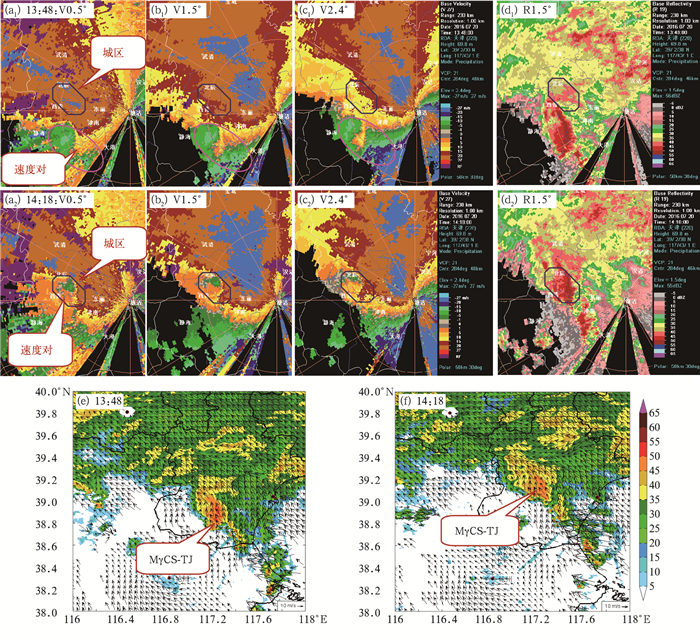 The two MγCSs are generated and maintained under different multi-scale background conditions: (a) MγCS-BJ is located in the vortex center (Zone D), which is the left front convective instability zone of the low-level jet, combined with the wind direction convergence line formed by the northerly wind and the east wind. The convergence line appears about 1.5 h earlier than the convective system. (b) MγCS-TJ is located in the edge zone between the cloud head and the vortex center. 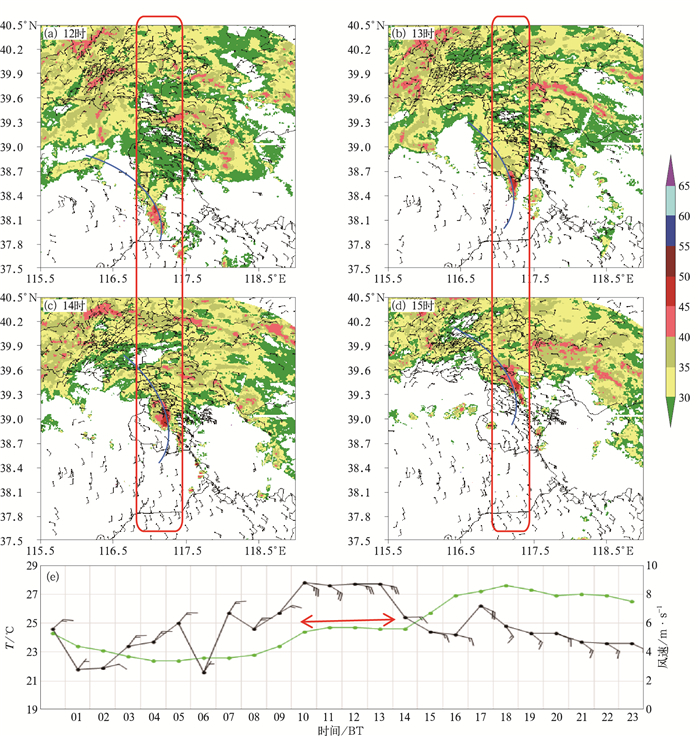 It occurs in the high-gradient energy frontal zone of θse and matches the surface wind speed convergence line. (3) The development of MγCS-TJ is closely related to the large-value zone of TBB gradient in the MβCS edge. MγCS-TJ has a deep mesocyclone inside, with the axis tilting to northwest, and the maximum rain intensity occurs at the moment when the rotation speed is the fastest. 陈渭民, 2005. 卫星气象学:第2版[M]. 北京: 气象出版社. 《华北暴雨》编写组, 1992. 华北暴雨[M]. 北京: 气象出版社. 孔凡超, 赵庆海, 李江波, 2016. 2013年7月冀中特大暴雨的中尺度系统特征和环境条件分析[J]. 气象, 42(5): 578-588. 雷蕾, 何娜, 孙继松, 等, 2017. "7·20"华北特大暴雨过程中低涡发展演变机制研究[J]. 气象学报, 75(5): 685-699. 梁丰, 陶诗言, 张小玲, 2006. 华北地区一次黄河气旋发生发展时所引起的暴雨诊断分析[J]. 应用气象学报, 17(3): 257-265. 卢乃锰, 吴蓉璋, 1997. 强对流降水云团的云图特征分析[J]. 应用气象学报, 8(3): 269-275. 孙建华, 张小玲, 卫捷, 等, 2005. 20世纪90年代华北大暴雨过程特征的分析研究[J]. 气候与环境研究, 10(3): 492-506. 孙淑清, 翟国庆, 1980. 低空急流的不稳定性及其对暴雨的触发作用[J]. 大气科学, 4(4): 327-337. 陶诗言, 1980. 中国之暴雨[M]. 北京: 科学出版社. 杨贵名, 毛冬艳, 姚秀萍, 2006. "强降水和黄海气旋"中的干侵入分析[J]. 高原气象, 25(1): 16-28.